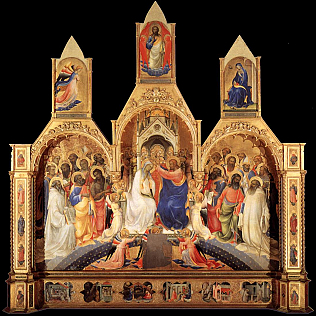 The Coronation of the Virgin is a great polyptych painted by Lorenzo Monaco (ca 1370 - 1425) in 1414. It is located in the Uffizi since the nineteenth century. The work is considered one of the Italian masterpieces of the International Gothic style. Lorenzo was a Camaldolese monk. Originally the painting was in the Florentine monastery in which the artist lived. It is a polyptich, which is a work composed of various scenes: the central and largest one, is obviously dedicated to the Virgin. The frame is part of the work. It is a wooden carved and gilded masterpiece, which creates the space for each scene. The central panel is unique, but apparently composed of three parts, because it follows the shape of the cusps at the top. The scene is set in paradise, as we can see from the heavens, represented by the blue and starry bands. Below, the Stories of Saint Benedict - the founder the Benedictine Order, which includes the Camaldolesi monks - and of Saint Bernard of Clairvaux are pictured. The gold background is not simple display of wealth, but a reminder of Lorenzo\'s deep religiosity. His artistic originality can be noticed in the choice of bright colors, in the elongated figures and in the drapery composition. The Coronation of the Virgin is considered one of the Florentine late-Gothic masterpieces.